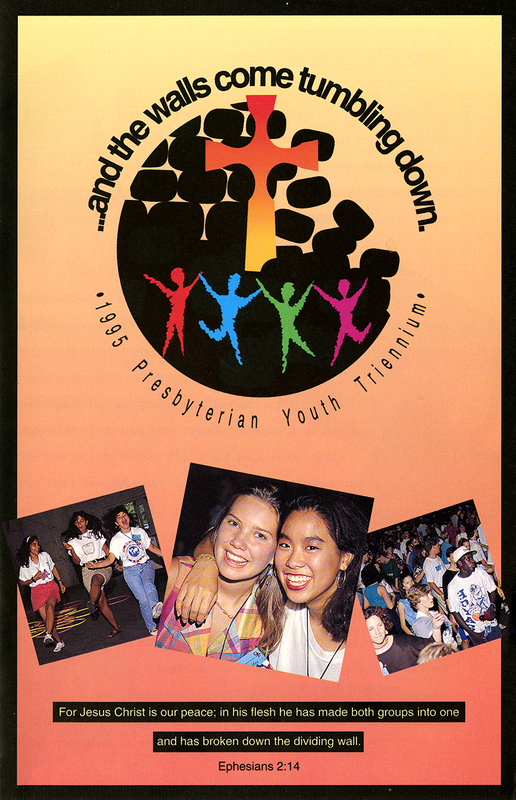 Thousands of young adults gather for the 1995 Presbyterian Youth Triennium. From the Ronald Rice Papers, 07 0320 137i. While the Presbyterian Church has a rich history of youth work and Christian education (take, for example, the Westminster Fellowship), a regular gathering the size and scope of the Triennium wasn’t developed until 1980. 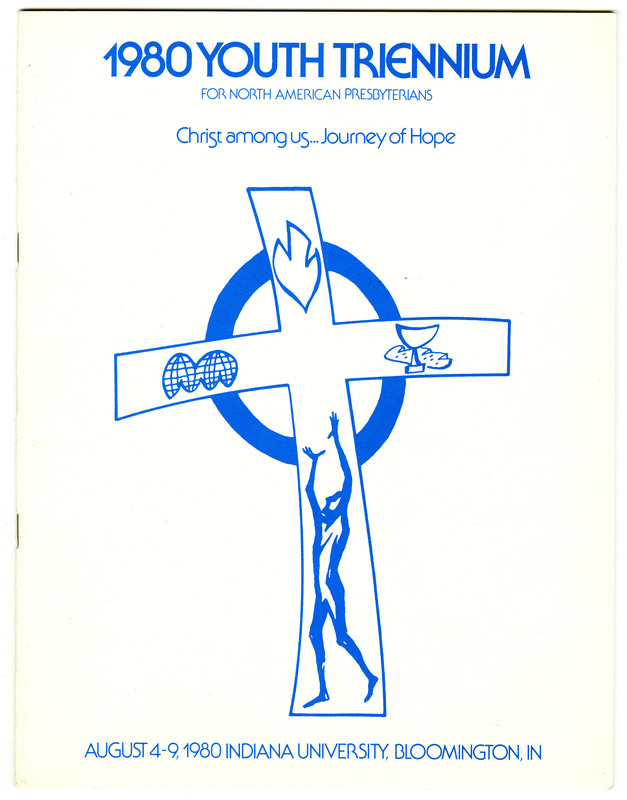 Three years earlier, the 1977 General Assembly of the United Presbyterian Church in the U.S.A. approved the Strategies for Implementation statement of the Design for Ministry in Youth–-a collection of structures and actions created to develop youth ministry within congregations and church-wide. Not only did the first Youth Triennium develop from the Design for Ministry in Youth, it became the primary youth gathering for Presbyterian denominations in North America. In addition to the United Presbyterian Church in the U.S.A., the Presbyterian Church in the U.S., the Presbyterian Church in Canada, and the Cumberland and Second Cumberland Presbyterian churches all participated in the first Youth Triennium in 1980. Program from the first Presbyterian Youth Triennium. From 95 1102B 98C. 1. To enable Presbyterian youth in North America to address the prophetic and crucial dilemmas of our world and embark on a journey toward global unity. 2. To enable Presbyterian youth to rediscover their Christian and Presbyterian roots, to nourish personal faith, and to develop leadership through worship, theological reflection, study and devotion. 3. To enable Presbyterian youth to participate in setting the directions for the youth ministry programming of their own Presbyterian denomination. The 1980 Youth Triennium was a great success, with approximately 3,700 young people attending, including 60 participants from overseas. The theme for that first gathering was “Christ Among Us…Journey of Hope.” A 300-member youth forum met to assess youth ministry in the church. Participants took leadership roles in youth ministry and left the Triennium prepared to share what they had learned with their congregations. The theme for the 1995 Youth Triennium was "...and the walls come tumbling down." From 95 1102B 98C. In laying down our nets, we as participants in the 1983 Youth Triennium are called to: (1) DISCOVER a new sense of purpose and commitment to Christ. (2) AFFIRM our membership in and responsibility to the worldwide body of Christ through our Presbyterian tradition, our particular denominations, and our local congregations; (3) RESPOND to Christ’s love as joyful believers and sharers of faith in our relationships and lifestyles; and (4) GO FORTH with a new awareness of and commitment to the demands of the Gospel as it calls us to speak and to act upon local, national, and global concerns. Students participated in Bible studies and workshops and smaller group work called “NETworks” that discussed topics such as teenage drinking and drug use. According to The Presbyterian Outlook, over 1,000 participants signed letters addressed to President Reagan and Soviet leader Yuri Andropov calling for an end to the arms race during the gathering. This year will mark the 13th Presbyterian Youth Triennium. While the cultural landscape has changed since 1980, many of the same issues will surely be explored. This year’s theme of “Go”—which alludes back to the second Youth Triennium’s goal to “GO FORTH”—will help young Presbyterians explore their faith and how they can make a positive impact in our society. 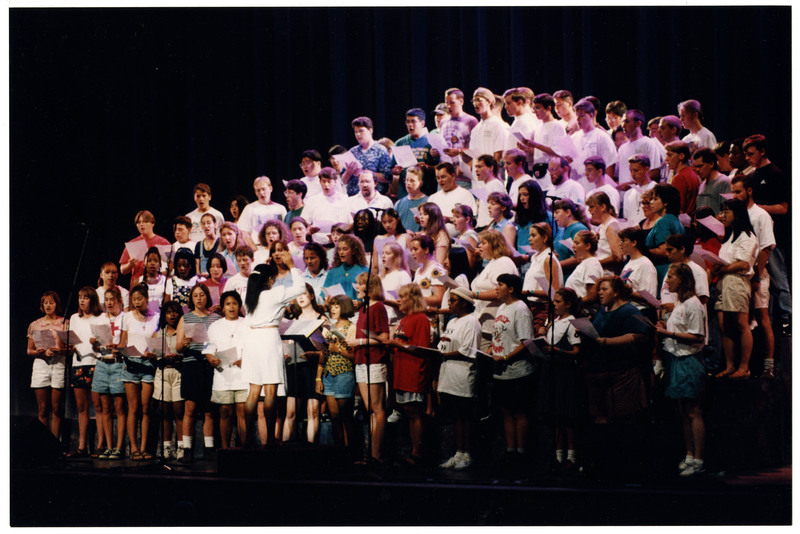 Choir performs at the 1995 Presbyterian Youth Triennium. From the Ronald Rice Papers, 07 0320 137i. Minutes of the General Assembly of the Cumberland Presbyterian Church, 1980. Minutes of the General Assembly of the Cumberland Presbyterian Church, 1983.